Carole, a lot depends on if you have slideouts in the motorhome. With today’s proliferation, I’m going to assume you do. 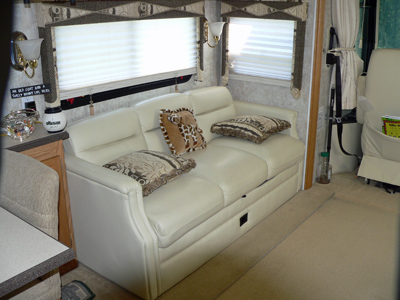 With that in mind, it would be best to contact an RV outfitting (decorating) company. There are quite a few located throughout the country. They differ from a regular dealership or stand-alone service center in that they specialize in updating, upgrading and redecorating primarily the interiors of coaches. 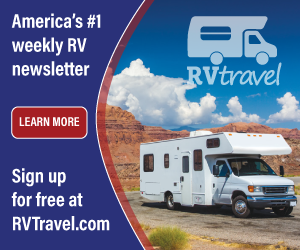 Start with a Google search for “RV Outfitter” or “RV Decorator” in your area. That said, I've seen some amazing work come out of a shop in eastern WA, Truline RV. Take a look at some of their photos! The slideouts pose the biggest problem for any service shop or RV decorator. Some rooms simply slide above the main coach flooring while others are flush with the finished flooring when extended. The shop must have experience with partial removal (at the very least) of the slideout room in order to get the finished flooring properly attached under the leading edge of the slide room in either case. To do so requires an expertise not usually found in a “typical” service shop. That said, it’s entirely possible your local motorhome dealer has that capacity. Most assuredly, a retail carpet store will not. So you should first learn exactly how your coach manufacturer installed the existing flooring and see if that would present a problem for any shop to remove and install a new flooring surface. Carpet or vinyl, either way, it will probably have to be tucked under the slide room and secured properly. I’ve gotten quite a few emails from readers who have experienced the problem of the slideout catching on the edge of the new flooring and damaging it. Most shops familiar with slideout removal and adjustments will probably have the tooling necessary to fully or partially remove the room, or at least tip it back somewhat creating room for the installer to get in there to attach the raw edge of the new flooring correctly. But it is certainly doable. I encourage you to take some photos of the process, if possible; it would make a good article!